iradiophilly | Culture - Philadelphia has Rare Chance at St. Patrick's Northern Lights; Aurora Borealis in Philly? 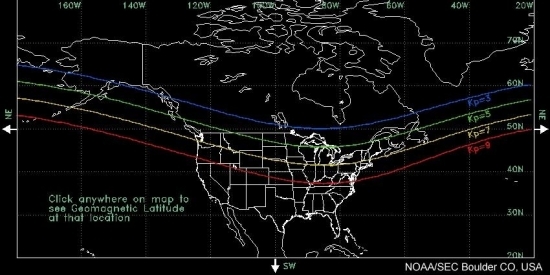 Philadelphia has Rare Chance at St. Patrick's Northern Lights; Aurora Borealis in Philly? A strong solar storm was detected around midday on Tuesday with a Kp Index of 8. That means there is a chance that the Philadelphia area will receive a dazzling display in the night sky tonight 3/17. The G4 geomagnetic storm ranked by NOAA's Space Weather Prediction Center could create the spectacular Northern Lights or Aurora Borealis in the skies over the Mid-Atlantic including Southeast Pennsylvania, New Jersey, and Delaware on St. Patrick's night. The storm started around 10 a.m. As long as the storm lasts, viewers in lower latitudes such as Philadelphia may have a chance to see the lights when it gets dark. Skies will be clearing tonight but it will be windy and cold, so bundle up if you head out. Solar flares and coronal mass ejections create auroras when radiation with charged particles from the sun interacts with the Earth's magnetic field and upper atmosphere. The effects are usually seen near the poles and weaken as they move toward the equator. In the north they are called aurora borealis, with the aurora australis in the southern hemisphere. During an exceptional solar storm the spectacular displays of light and color can be seen at lower latitudes nearer to the horizon instead of up in the sky. The radiation from the flare can also cause disturbances to electronics such as cell phones, GPS, and radios. The best place to watch the northern lights will be outside of the City of Philadelphia itself and away from the Center City lights where the sky is darkest. A clear view of northern horizon will help you spot those auroras materialize. The further north you are the better your chances will be, so the Poconos will be in a great position tonight to see nature's fireworks. iradiophilly offers over 20 free radio stations streaming on the web or our free mobile app. Just choose your favorite music for your aurora viewing soundtrack!